Exploring the extraordinary stories behind Britain’s landscapes has never been easier thanks to a series of new interactive walking routes from the Royal Geographical Society (with IBG) that you can download and follow on your smartphone. Discovering Britain is a major walking project from RGS-IBG that encourages deeper engagement with Britain’s rich and diverse landscapes through a series of digital route guides exploring the stories behind our nation’s geography, history and culture. A strong narrative underpins each route, immersing walkers in tales of England, Scotland, Wales and Northern Ireland’s natural and human landscapes, with the free ViewRanger GPS app providing an interactive experience along each route. All 24 Discovering Britain routes in the South West of England are now available to download and follow for free in the ViewRanger app; complete with turn-by-turn directions, facts, photographs and audio files. More than 200 Discovering Britain routes in total will be published in ViewRanger over the coming months, covering the whole UK, so keep an eye out for further announcements. To follow Discovering Britain routes on your smartphone, tablet or smartwatch, simply download the free ViewRanger app from the Apple App Store or Google Play, then either search for Royal Geographical Society routes in the app or click this link to explore the South West of England collection. Download Discovering Britain routes in the ViewRanger app here. Learn more about the Discovering Britain project here. ViewRanger is a free GPS navigation app used by millions of people around the world to plan, navigate, record and share outdoor adventures. Combining the world’s best offline maps with easy-to-follow route guides, advanced GPS navigation features and augmented reality, ViewRanger is the ultimate adventure tool for anyone exploring the great outdoors. 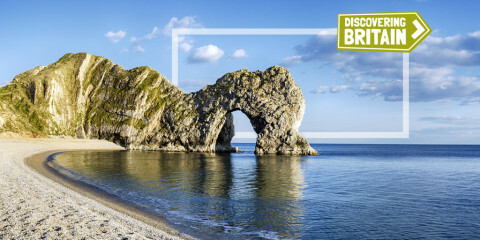 Discovering Britain has been created by the Royal Geographical Society (with IBG) to help people learn more about the geographical stories behind Britain’s rich and varied landscapes. However much or little time you have, there is a self-led Discovering Britain activity to suit you. From viewpoints and short trails to longer walks, the stories that Britain’s landscape has to tell are waiting to be uncovered.